With the closing date for the 36-hole tournament at Oundle GC being seven days before the event, the county juniors will hope to follow in the footsteps of previous winners Gary Boyd, Charley Hull and Meghan MacLaren. Claimed in 2017 by Liam McNeela and Ellie Darnell, who is competing again after also winning the ladies crown earlier this month, the respective boys and girls gross titles are expected to be keenly contested. Luis Witherall, Owen Watts, Joe Quinn, Hattie Billson and Katie Amos will be in confident mood after playing for their respective county adult teams this spring. 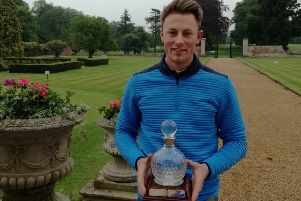 Joseph Hyde won the 2018 NGL County Academy Par 3 crown at Brampton Heath, while several players have been in action for the boys and girls county teams in recent weeks. Trophies will go to the leading gross and net scores, the best youngsters in the under-14, under-16 and under-18 age groups will collect prizes, while points are also up for grabs in the 2018 NGL Junior Order of Merit. This individual event will be combined with the NGL Junior Inter Team Championship as players from several county clubs battle it out for The Scottish Cup, The Shoe and Leather Trophy and The Irish Cup. The Champion Club will be the team with the best combined stableford scores for three of its four members and will qualify to enter a side in the 2018 England Golf Junior Team Championship later this year. NORTHAMPTON’S Ben Jones played a lead role for England men’s team as they kept up their impressive international record against France with a 13-7 win at Vidauban GC, near Nice. the second day with a one-point advantage as he thrashed his singles opponent 7&5. With rain on the final day wiping out the morning pairs as England chased a 30th success in the biennial match, the Northants County member wasted little time in maintaining his perfect record with another impressive 5&4 win in the singles. Jones is one of two players, alongside Peterborough Milton’s Robin Williams, in the top five in the latest European Golf Rankings. The plus-five handicapper lies third in the standings, while Williams is fifth - the highest ranked player under the age of 18. Marc Benzie and Paul Robinson were the key partnership for Rushden in their first fixture of the season as the team defeated Overstone 9-3 at home. With both sides winning two matches and halving the other, Benzie and Robinson ensured Rushden got off to the ideal start as they strolled to a seven-hole victory in the third tie. Peterborough Milton proved too strong for Delapre in the middle ties as they recorded an 11-6 home victory. Although the visitors clinched the first and last games, Graham Marshall and Lee Talbot (three holes), Sav Fasulo and Dave Wright (six holes) and Hugo Laffey and Tim Martin (two holes) turned the match Milton’s way. Cold Ashby produced a blistering performance at Delapre as they recorded a collection of big wins in a 5-2 away success. Although Delapre’s Jackie Rolfe and Katie Ashton both secured good wins, it proved in vain as Sally Lawrenson (3&2), Marguerite Kraus-Rudder (5&3), Barbara Steane (4&3), Rose Dempsey (5&3) and Julie Bott (7&6) wrapped up an impressive victory. Peterborough Milton remain neck-and-neck with Ashby at the top on two wins after edging a tight home contest with local rivals Oundle by a single point. After Milton’s Gill Preston, Rachael Fisher and LJ Gill clinched the first three ties, Oundle fought back with three 2&1 wins from Ros Riley, Liz Swan and Sheila Homer only for Sandra Stout to secure the home success with a 3&2 victory in the final tie. Kingsthorpe were at their ruthless best in their opening fixture of the year as they stormed to a 7-0 home victory against Brampton Heath. The hosts were particularly impressive at the front and start of the line-up as Juanita Pryer got the team going with a 6&5 win before Shirley Martin (6&4) and Karen Molford (7&6) wrapped up the scoring. 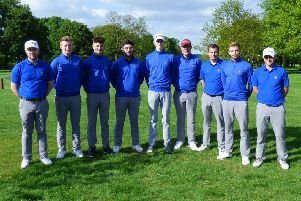 Brampton Heath went into the contest in confident mood after securing their first victory of the campaign earlier in the week as they won 4-3 at home to Elton Furze - Jean Pickering bagging the decisive point on the closing hole.